The Medium-Grade Green Tarps from TarpUSA™ are typically used for wood pile covers, camping, storage covers and equipment covers. 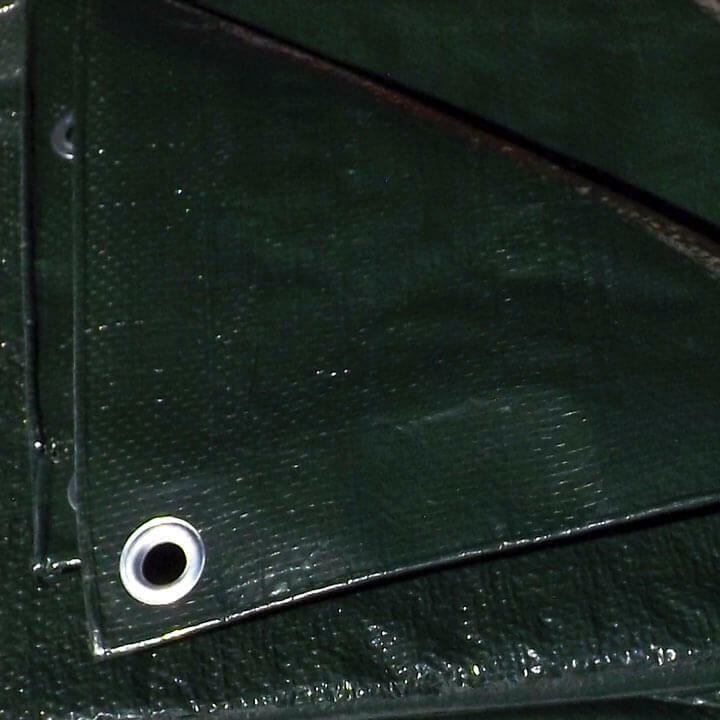 These green poly tarps are 9-10 mil thick laminated polyethylene and have a weight 4.5 ounce per square yard. They are made from 1000 Denier with a 10x10 weave count. The forest green tarps give the Look Of The Forest that blends in great with wooded surroundings. They are lighter than a heavy duty tarp, yet thicker and stronger than an economy tarp. Our medium grade tarps are waterproof, mildew resistant, tear resistant and acid resistant. 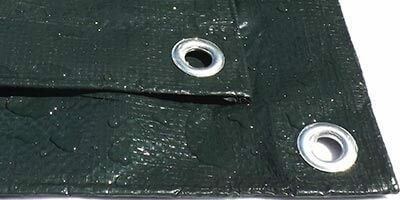 The green tarp come with metal grommets installed about every 36 inches along each side for your convenience. The hems are reinforced with poly twine. Please note that the finished measured size is roughly 3% to 5% smaller than the quoted sizes below. For large quantities, custom-size green tarps or bulk-shipping rates, please call us at (800) 352-6609. The high quality 6 foot by 8 foot green tarp is in-stock and ships fast nationwide. These green tarps are ideal for home repairs, construction projects and roof covers. The high quality 8 foot by 10 foot green tarp is in-stock and ships fast nationwide. These green tarps are ideal for home repairs, construction projects and roof covers. The high quality 9 foot by 12 foot green tarp is in-stock and ships fast nationwide. These green tarps are ideal for home repairs, construction projects and roof covers. The high quality 12 foot by 25 foot green tarp is in-stock and ships fast nationwide. These green tarps are ideal for home repairs, construction projects and roof covers. The high quality 12 foot by 14 foot green tarp is in-stock and ships fast nationwide. These green tarps are ideal for home repairs, construction projects and roof covers. The high quality 14 foot by 18 foot green tarp is in-stock and ships fast nationwide. These green tarps are ideal for home repairs, construction projects and roof covers. The high quality 20 foot by 20 foot green tarp is in-stock and ships fast nationwide. These green tarps are ideal for home repairs, construction projects and roof covers. The high quality 20 foot by 30 foot green tarp is in-stock and ships fast nationwide. These green tarps are ideal for home repairs, construction projects and roof covers. The high quality 40 foot by 60 foot green tarp is in-stock and ships fast nationwide. These green tarps are ideal for home repairs, construction projects and roof covers.